Head to the Pureology Serious Colour Care Facebook page, click on the Watch and Win! tab then watch the short video. 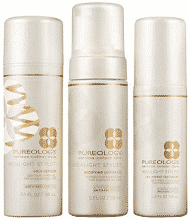 You’ll then see the entry form appear under the video where you can submit your information for a chance to win FREE deluxe size samples of Pureology Highlight Stylist products! There will be 7,000 winners. This giveaway ends August, 31, 2013. Good luck!